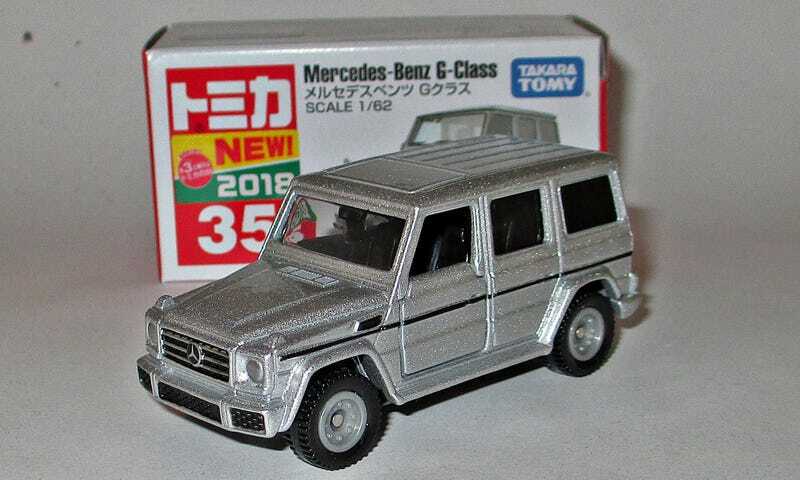 So here’s the G-Wagen - one of those models I didn’t expect to come from Tomica. And looking at it, it somehow still looks more like a Siku than a Tomica to me. Not that there’s anything wrong with that. Though the suspension and the slightly grainy silver paint are typical Tomica, the wheels certainly are not. But they have featured on the occasional 4WD before. Also typical are the cast in back windows, not something that I applaud. I couldn’t resist putting it next to its rival from Majorette. That one is “one bigger” at 1/61 vs the Tomicas’ 1/62 - but there’s not much in it. And both have an opening feature - the engine hood vs the front doors. I like some of the front end detail better on the Tomica, at the back end, the Majorette does it better for me. On the side, the wobbly black lines on the Majorette distract more than they help. So - there you go - good efforts from both sides - the rest it personal taste I guess.